This grid represents 36 zones of employment, and the report provides a perspective on each zone. 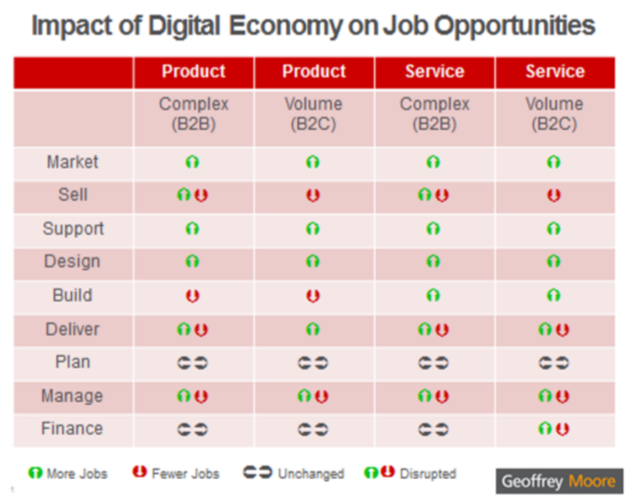 What I found interesting was the major macroeconomic forces described by Mr. Moore in the context of job creation, and their related effect on digital transformation. 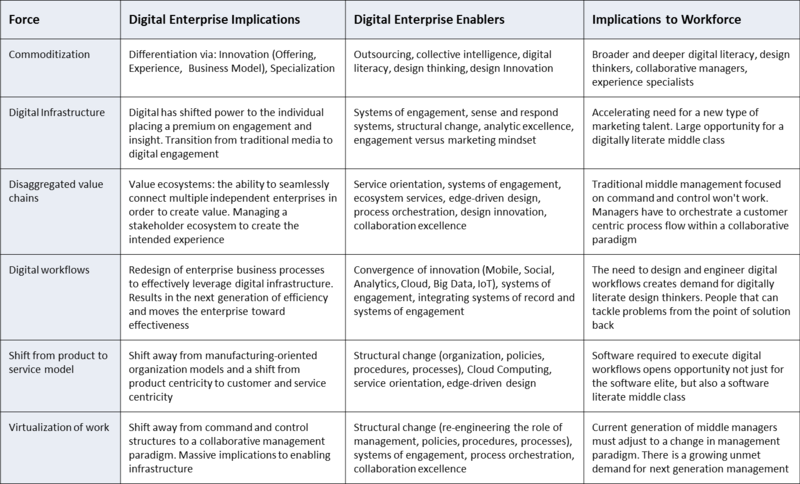 So for the purposes of the digital enterprise journey pursued by this Blog, I took a look at the relationship between the forces, the Digital Enterprise and the workforce. The resulting grid maps out that perspective (click on the image below for a larger view). All of this underscores the massive implications of the disruptive forces affecting us today across business, government and countries. From the issues of public policy required to stem the tide of an eroding middle class in developed countries, to the transformative steps required by companies of all sizes – change lies ahead. I really like the way Mr. Moore describes the movement from command and control management structures to a collaborative paradigm – the re-engineering of the role of manager, if not management itself. Again, this points to the need for structural change. In my mind, we are not talking about the efficiency driven re-engineering initiatives of the 90’s, but a sea change in enterprise structure. This may be more evolution than revolution, but with the pace of change being what it is, evolution windows are shrinking. The report from Geoffrey Moore is a must read, as it talks to one of the more pressing word challenges of our day. As you read it, I encourage you to make the connections back to the enterprise transformation agenda that lies before all of us. ← Where are we on the Bring your own Device Journey?